If you decide to lie or not to disclose information about your criminality to an Immigration officer when entering Canada, you may face severe consequences. When you are dealing with immigration officers, you need to be honest and straight-forward, especially with regards to any criminal record you may have. Do not ever feel you can get away from being scrutinized, because immigration officers do have the ability and authority to check your criminal record to compare with the information that you have provided. In this blog, you will learn the importance of disclosing the correct information to the Immigration officer. If an immigration officer detects your criminal past, it is crucial for you to answer all questions asked by that officer correctly and directly. This is the case even if you have a minor charge. When you encounter such situation, the immigration officer usually decides to see whether the individual will respond accurately or lie about the criminal record. It is important to note, you may still be denied entry to Canada, even if you do disclose the correct information. There are ways to prevent this from happening. For instance, you may apply for a Temporary Resident Permit or a Criminal Rehabilitation before attempting to enter Canada to overcome your criminal inadmissibility. As a result, you should always keep in mind that providing the right information often leads to less severe consequences or outcomes compared to providing Immigration with false, inconsistent or incomplete information. This depends on whether or not you were banned from entering Canada. If you were not banned, you could attempt to enter Canada with misrepresentation. If you were banned from Canada for five years, you would have to wait until the termination of the ban. After that, you can attempt to enter Canada. If you were not banned from Canada, there may be other options available for you. For instance, you may apply for a Temporary Resident Permit if you need to enter Canada temporarily for a very important reason, such as attending a business meeting, visiting a sick family member, or attending family gathering. The Temporary Resident Permit allows an individual to enter Canada and overcome inadmissibility temporarily for a period, ranging from one day to three years. On the other hand, if you would like to overcome your inadmissibility permanently, you could apply for a Criminal Rehabilitation. This can only be a permanent solution if you do not re-offend after your latest incident. In order to apply for criminal rehabilitation, you will need to make sure five years have successfully elapsed since the completion of all sentences imposed. That being said, you must wait for enough time to pass in order to attempt to return to Canada. It is important for you to keep in mind that having a misrepresentation allegation on your record in Immigration can negatively affect your chances of entering Canada. In order to ensure that all Canadian citizens and permanent residents are kept safe from any potential risks or threats, Immigration, Refugees, and Citizenship Canada takes fraud and misrepresentation very seriously. Therefore, if you are applying for a Temporary Resident Permit or a Criminal Rehabilitation, the ultimate decision is completely at the discretion of the Immigration officer, meaning that they may still refuse your entry just because of the misrepresentation. As previously mentioned, Canadian government is very strict when it comes to assessing foreign travelers’ inadmissibility. In order to compile a strong temporary resident permit or a criminal rehabilitation application, you will need to prepare for the correct documents. However, having to prepare all the required documents can very confusing and exhausting. It is also essential to note that this type of application is difficult to pursue on your own. Therefore, it is highly recommended that you seek professional and experienced help prior to submitting the application. Akrami & Associates work and have experience with many different immigration matters. We have helped many of our clients create strong temporary resident permit and criminal rehabilitation applications. Please feel free to contact Akrami & Associates at 416-477-2545 ( info@thevisa.ca) for more information, or if you would like to book a consultation with an immigration professional for more advice. 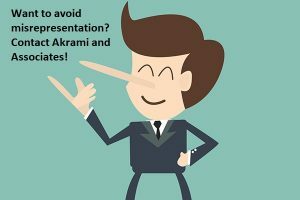 With Akrami & Associates, there is always a way!